Our yurt is a fantastic cosy outdoor space, complete with wood-burner, where our Forest School team and Garden Educator are based throughout the week. 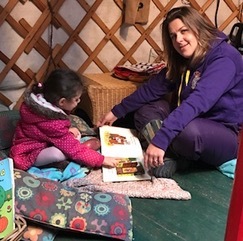 On a rotating basis, children will have the opportunity to spend whole days outside, retreating to the yurt for warming hot chocolate and the wood-burning stove. Children wear scandinavian all in one waterproofs provided by the nursery in the colder, damp weather, and sunhat and suncream and some shaded areas provide protection from the sun. Taking children outdoors regularly allows them to negotiate uneven ground, circumnavigate logs, and get to know wildlife and precious flowers and helps even the youngest walkers to manage themselves and better judge risks. We commit to offering a more heuristic and real experience of the great outdoors that we hope will inspire them and encourage a love and respect for nature for years to come. It is too easy under the guise of health and safety to try and remove the risks and therefore take away any challenge in the activity or environment for the children. We understand that a child's need for challenge is part of learning and experimentation. The importance to us of all of our outdoor education is in providing children the opportunity to take risks, encourage the right choices and build their self-confidence. Our team brings a thoughtful and observant process to how the children are learning, getting many of their ideas from Forest School trips with the children who like to bring back stories from the woods. These stories are extended and explored, shared with others and lead to emergent curriculums throughout the week.